Powertex textile hardener Transparent is an environmentally-friendly, water-based, liquid medium that can replace polyester for fabric hardening. 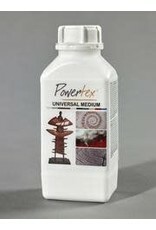 Powertex Transparent is a white liquid that dries clear showing the original patterns and colors of fabrics. 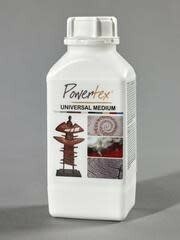 You can create your own Powertex colour by adding powder pigments. Dissolve the pigments in a little warm water and stir into the Powertex. Powertex Transparent is NOT weather resistant and is mostly used for indoor artwork. To make it waterproof it needs a coat of Easy Varnish. Artwork can be painted with color pigments, patina, acrylics or oil paint.